Some of my family loves sweet potatoes and some love regular mashed potatoes. For Christmas last year, I decided to make both. However, after making so many dishes, I was running out of room to places all the food. I decided to make this super easy, but really cool to look at potato dish. 1. Use your favorite sweet potato and mashed potato recipes to make the potatoes. 2. Lightly spray the baking dish. 3. Place a spoonful of sweet potatoes in the corner. 4. 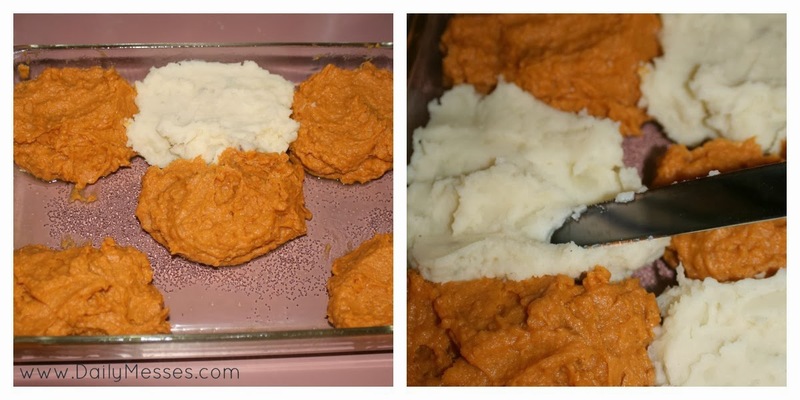 Place a spoonful of mashed potatoes next to the sweet potatoes. 5. Repeat until the row is filled. You want to end with sweet potatoes. 6. On the next row, start (and end) with mashed potatoes. 7. On the final row, start (and end) with sweet potatoes. 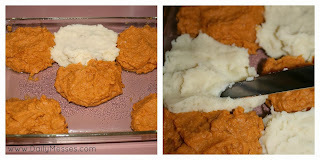 sweet potatoes in an X shape and then filled in gaps with mashed potatoes. 8. Use a knife or spoon to smooth out the potatoes and fill in any gaps. 9. Bake at 350 degrees F for about 30 minutes, or until heated through and tops are lightly browned.